Brushing your dog’s teeth might be something that you have never really paid much mind to but, like us humans, it is an integral part to their general health. If we do not brush our own teeth, plaque will begin to build-up and eventually rot our teeth away; you may not realise it, but the same thing will begin to happen to your dog’s if you do not look after them. Good dental care will not only improve their breath, but it can also boost their overall wellbeing and happiness. Plaque and tartar buildup can also lead to serious hygiene issues and life-threatening kidney, heart and liver infections. Don’t panic though, this can all be easily avoided through regular brushing of your dog’s teeth. This blog post will talk you through everything you will need to know to improve your pooch’s quality of life; from picking a toothbrush to getting the process right. We want to make sure the process is as easy and stress-free as possible. The better it is, the more likely it is that you will want to keep on top of your dog’s dental hygiene. So let’s begin by arming yourself with the right tools. Dog toothbrushes are designed with dogs in mind; their unusual shapes are built around the unusual shape of a dog’s teeth. This is why you should never use a human toothbrush, it simply won’t reach where it needs to reach. Pick your brush based on your dog’s size. A smaller toothbrush could be problematic for a St. Bernard; and you may not get very far using a large toothbrush with a Shitzu! Dog toothbrushes are made with softer bristles than human toothbrushes to help you reach all those difficult spots. This is why you mustn’t use adult human toothbrushes but you can use a soft child’s toothbrush if you have no other alternative. You can also pick up ‘finger brushes’ which pop on the end of your finger and and helps you to get to those hard to reach areas. Be careful though, as these do increase the chance that your dog will nip you. If you are opting for a traditional dog toothbrush, we recommend the Cet toothbrush for it’s price, reach and sturdiness. Like toothbrushes, there are many different options when it comes to toothpaste for your dog. There are lots of flavours to choose from which is great as it means that you can try several flavours to find the one which works best for your dog. We recommend Arm & Hammer Tartar Control Beef Flavoured Toothpaste. It is on par with the market’s price points, a trusted and well-known brand and the flavour always goes down well! Never give your dog human toothpaste as they contain fluoride and other ingredients which can be toxic. Unlike humans, dogs will most-likely swallow the toothpaste during brushing. Before you begin, ensure your dog is comfortable with you placing your fingers in their mouth. If they flinch or look in anyway nervous focus your energy on first having them be fully comfortable with you. It is also worth noting that the process will be far easier for you if your dog is calm and relaxed, perhaps after a tiring walk. This reduces the likelihood that they will wriggle and squirm the whole time! You should start as young as possible to help your dog become comfortable with the process – you can start from as young as 8 weeks old! But if your dog is older, don’t worry, you can start from any age. Just be more cautious and patient with them as they may not be fully accepting at first. It is important to note that this is all going to be new and, probably, a little daunting for your dog. That is why you should do your best to ease them into the tooth brushing process gradually. If you move too fast you could scare your dog, giving yourself a much tougher mountain to climb. Start small, be patient and only progress on your dog’s terms. If you find yourself fighting with the dog or struggling to have them cooperate, stop! You are only going to stress them out and make it impossible for even a trained professional to clean their teeth. Let your dog taste the toothpaste from your finger. This is to ensure that your dog is happy with the flavour. If they run a mile, it is unlikely you will have a successful brush. If your dog is comfortable, rub a dab of toothpaste along the gums with your finger. This is a similar motion to when you brush their teeth and will help them transition. Now, hold the toothbrush up to your dog and let them inspect it on their terms. Add a dab of toothpaste to it and praise them heavily if they lick it off. Start with some of the easier to reach teeth (the canine’s are often the easiest to get to). Lift the lip gently and rub the brush against the front teeth in a circular motion. Do this slowly with little intention of actually cleaning for now. we are still just trying to get your dog used to this new sensation. If your dog is a little nervous or squirmy, you may want to do this motion without toothpaste to start with, to avoid wasting it. Once they are more relaxed add the toothpaste. A calm, soothing voice can often help relax a nervous dog but if this is not working, it might be worth taking a break for an hour; or perhaps even trying again tomorrow. Once you have got your dog to relax and gently brushed their front teeth, stop the session there. Quit while you’re ahead and reward your dog with a treat, lots of praise and some space! I know this is going to feel frustrating but trust me, it is for the best long-term. Doing this will prevent the risk of stressing your dog out and giving them negative connotations with the process – stopping today is much better for tomorrow. So hopefully now your dog is comfortable with the feeling of the toothbrush and the taste of the toothpaste in their mouth. This means we are ready to begin giving your dog’s teeth a good clean. To do this, start on the front teeth again, repeating the same motion as before. Slowly work your way across the outside of your dog’s teeth, one tooth at a time. Do not worry about the inside of the teeth for now, just focus on brushing the outside of the tooth. Pick a side to start with (i.e. the upper right row – from the canine working towards the right molars). In an hour, or even tomorrow, you will repeat this row and move on the top left side straight away. Again, this is gradual progression is to limit the chance of your dog becoming distressed and afraid of the process. Once you can do both sides of the upper teeth in one session, add the bottom teeth into the mix. The goal is take baby steps towards brushing the outside of all of your dog’s teeth in one session. Be sure to keep them reassured the whole time with a calm and soothing voice. Once you are finished, give them lots of love and praise again. If you have managed to brush the outside of all of your dog’s teeth in one session and they are relaxed and now unphased by the process you are ready to focus on the inside teeth. If your pooch is still a little nervous, continue to work on the outside until they are relaxed. This step involves you putting your fingers inside their mouth and there is some risk of a panicked dog biting. Now place your hand over your dog’s muzzle and, lifting the upper lips, open their mouth. If your dog is a little reluctant, you can gently apply pressure to help them open. Once their mouth is open, brush a small area of the inner teeth. Make sure, as before, you pick just one small area to focus on – often the premolars or molars are the easiest the start with. And, again, begin to work your way around the inside of their mouth. Do not rush and take your time. Done properly, your dog will have complete faith in you and submit to the brushing. Though, for many of us, it may be impossible to brush your dog’s teeth everyday you should try your very best to. A regular two-minute brush each day (or every other day) will not only make it easier each time but will work towards a healthy mouth, fresher breath and a happier dog. The best way to keep it regular is to find a time which works each day. Whether it be a quick brush whilst your sat there watching TV or just before you do your own teeth, find a routine that you can stick to and make time to brush your dog’s teeth. You wouldn’t go a week between brushing your own teeth would you? If you are struggling to have your dog get comfortable with the teeth brushing process, we have written the perfect blog post for you. 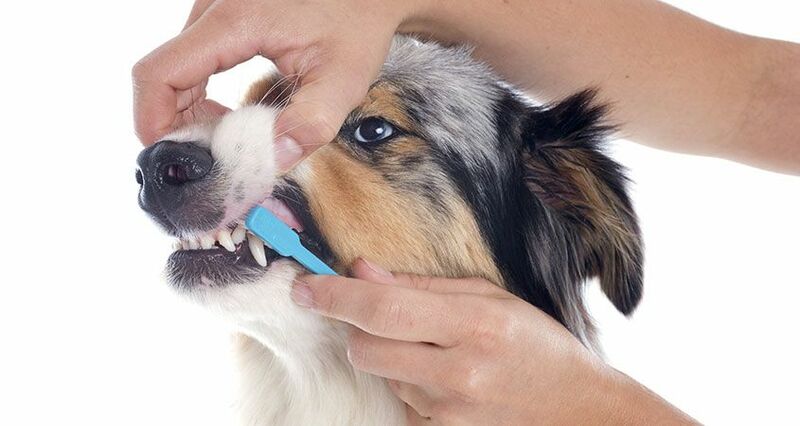 Check out “5 Ways to Clean Your Dog’s Teeth without Brushing” now. So to wrap this (rather lengthy) post up, it is extremely important for your dog to maintain a healthy mouth. If they had opposable thumbs, they would probably do it themselves; but (as they don’t) it is your responsibility to do it for them. Always remember, that your dog must be fully comfortable with you handling their mouth before you proceed. Following the above steps should help you build up to a relationship in which your dog is completely relaxed when having their teeth brushed; but it does take time and patience. You will get much further with your dog if you do let them progress to the next stage on their terms; but if for whatever reason you are struggling we recommend you do just stop. Fighting with a dog to brush their teeth is only going to distress them and make it impossible for even a trained professional to clean them. If you have decided it isn’t working out for you, our professional groomers offer a dog teeth brushing service for just £9.95? Our trained team will handle your dog with care to thoroughly brush their teeths – of course, only if your pooch is comfortable. But, if your dog is uncomfortable with their mouths being touched, you might consider popping along to one of our Puppy Parties or Training Classes for some in-person advice and guidance to help them become more relaxed when being handled.